How do you know our courses are good value for your money? Well, you don’t have to take our word for it, hear from some of our past students! We get so many great reviews every year it can be hard to choose between them! Here is a selection of some of our past students giving their thoughts on our courses. Each one of these reviews is from someone who studied here with us in Tenerife or online at home. We can easily guarantee all our reviews are genuine because we get so much positive feedback! 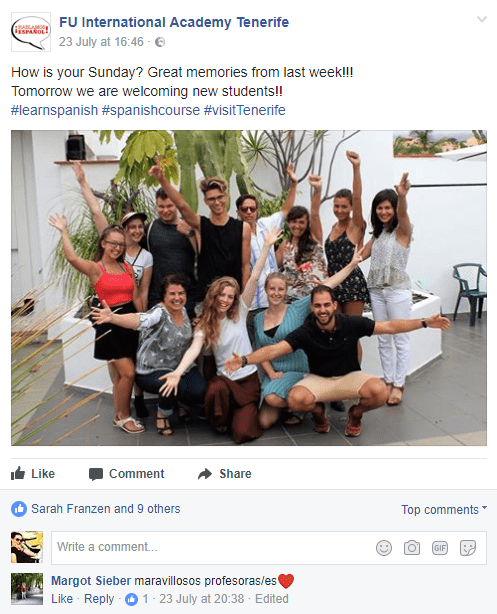 We hope that hearing from some of our previous students will help you to decide to join us in Tenerife and finally learn Spanish. Due to my holiday in Central America next year I want to learn Spanish to be prepared and to communicate with the local people. So I chose an Intensive course 30 for two weeks, that was divided into group lessons and private lessons. I really like the lessons, the teachers speak slowly and very clear. The group lessons are in small groups, is well-structured and diversified – besides reading texts and watching films the units will repeat in small games. In the private lessons, we talked a lot and they react to my individual learning objective. Additional to the Spanish courses the FU provide a great and varied leisure time activities, that is mostly included in the course price. Besides surfing and volleyball, there are dancing courses for the Spanish dances Salsa and Bachata, which I really like. During my time in Puerto de la Cruz a stay at a kind guest family, which extends a warm welcome. It was a good opportunity to use and repeat the new vocabulary. All in all, I really enjoyed my two weeks at FU in Puerto de la Cruz. Besides learning the Spanish language I also learned the Spanish culture (most of all tapas and sangria) and got to know great people, I still stay in touch. Every day the lessons varied, with new vocabulary, grammar exercises, listening comprehension and conversation. My teachers Daphne, Rosemary and Alvaro taught me their native tongue with passion. They explained everything in a very understandable manner and they also gave me many tips that will help me quite a lot when it comes to teaching my own students back in Austria. In the beginning, my Spanish language level was at zero, but thanks to the solid organization and professionalism of my teacher, I was able to reach as far as level A1.4 during my stay! Super nice people and teachers. Also, I enjoyed learning in small groups. It made the lessons even more intense, and this helped to improve my Spanish really quickly. The atmosphere at FUIA was cheerful and comfortable and I always felt at home. The school activities were varied and well planned. We shared breakfast every Monday on the beautiful terrace of the school’s cafe. I greatly improved my language skills within a short period of time . Also, I met many new persons at the FU International Academy. Thanks to the shared apartments at the “Jardin Tucan Residence,” we all had the opportunity to meet in the afternoon easily. In addition, the school has a really great activity program! I found that the staff and teachers were very friendly and open-minded. They showed interest in the students beyond the necessary formalities and classes, and they also enjoyed chatting about private topics. This further loosened the already relaxed and casual atmosphere. Every day I looked forward to going to school because of this. The teachers (and I know four of them) and I got along very well as they are without exception very friendly and polite. Besides their tremendous experience in teaching and undoubtful professional competence, you feel their dedication to teach the students new things and enjoy learning a new language. And above all, they have been very patient with me, which I really admire. Additionally, the classes are not too serious, as we are laughing very often. Every teacher at FUIA is so friendly and warm (including the ones who are not teaching you), that you forget about your inhibitions. Even as a beginner, you get the courage to stammer the first few sentences in Spanish. In the afternoon cultural classes were offered. I liked them a lot because I got to know the Spanish tapas culture. Furthermore, I enjoyed watching Spanish movies. There are many good movies at the academy, which was quite helpful to practice my Spanish comprehension. The course was very nice. All the people were very helpful and we had a really wonderful time. We hope to come here again. Thank you very much. 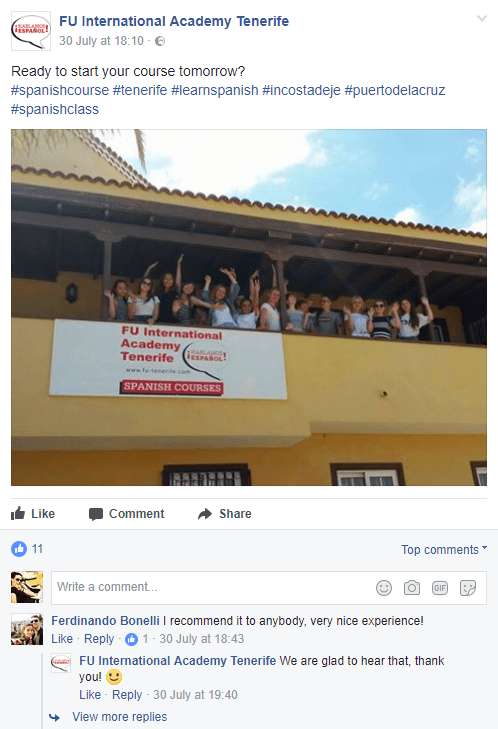 We had a great time during our stay of 6 weeks in Tenerife at FU International Academy. We enjoyed the course, the salsa lessons, the beach, the sun and the night life. I am satisfied with the course at this school. I think that the professors are well prepared and the classes were interesting. The classes are well structured. The teachers speak slowly and clearly and when it is necessary they communicate with hands and feet – A big compliment to our teacher, she does a really good job! The accommodation was comfortable and was „language separated“, which means that in my flat there were no other Germans so I was not able to speak German. This is a real benefit when you want to learn a language. Every afternoon the FU International Academy offers different free time activities, which are included in the price you pay for your language course. My resume is that I have learned a lot here, met some interesting and nice people and stayed on a fantastic island, which I really do not want to leave. I´ve chosen Tenerife, the FU International Academy, to take a course of Spanish and here in Puerto de la Cruz. I liked the lessons. There weren´t many students in one course and therefore it was a direct, constant and educational contact between the teacher and the students. I liked above all speaking about literature and cultural subjects. The teacher has a very good cultural knowledge level and this was important to exchange opinions and experiences. The accommodation was comfortable and clean. In Puerto I liked the “Lago Martianez”, a huge swimming pool landscape with sea water and the different local fiestas. I was very lucky to spend 6 months at the FU International Academy because I was preparing for a big language test. My time here was ingenious; I haven’t only learned the language but also the culture and lot of great people.My teacher, who accompanied me during all of my stay, was very friendly and helpful. Due to her my Spanish language skills improved a lot. We laughed plenty of times in class and had a good time together. Because of the language, all the students of different countries melt together and you can learn more about other cultures of the world as well.Willingly I will come back to the FU International Academy, who guided me cordially through my time at Tenerife and I look forward to having my next tasty “cortado” in the cafeteria. 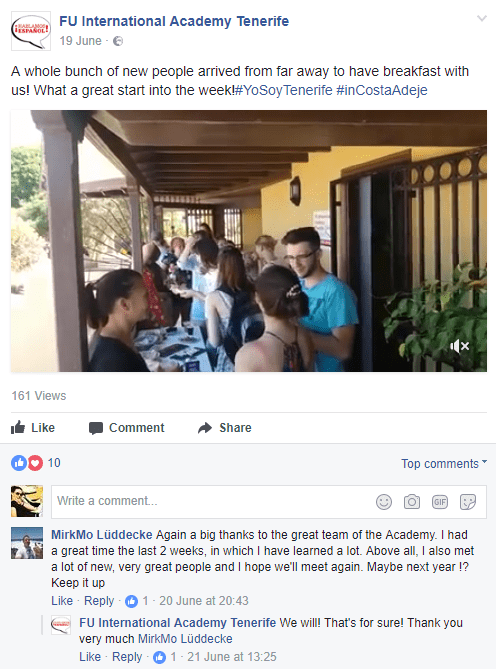 Attended a 3 weeks onsite Spanish course in Tenerife, followed now by an online course (because we all know, that you won’t continue learning on your own ;)). My online teacher is Pilar, who also taught me at school in Costa Adeje. The course is very well structured (new agenda for each week) and a perfect mixture of grammar and free speaking. The workload depends completely on my preferences. Highly appreciate FU’s flexibility and friendliness. Recommendable! My impression of the school was good. I think that the school is recommendable. To learn Spanish for business on such a beautiful island so close to the sea is awesome and makes it even more enjoyable. The memories will remain. Everybody who intends to learn Spanish, I would recommend to come here to this school where you can study and enjoy a pleasant ambience in form of a vacation at the same time by taking private lessons. I had a very good time over here. I´ve learned a lot, especially because of the small classes. My teacher was very kind, patient and creative. I liked her classes a lot. I can recommend staying with a host family. In that way, you learn so much more about the language and about Tenerife and its tradition. I’ve been taking the Spanish Online Course for more than two years. It’s fantastic because I’m with the same teacher with whom I had classes when I was studying on the island. He’s incredible and has been a great help for me. For my new job I need a medium level of Spanish. My teacher helps me improve my communication skills which are important to improve my own performance. Thank you FU International Academy for providing this opportunity! My experience here in FU language school has been great. The teachers here are great and I learned a lot more in Spanish than I thought I would. This island has many different and exciting things you can do for fun when you are not at school. Overall my stay here has been more fun, exciting and instructive than I had ever expected. 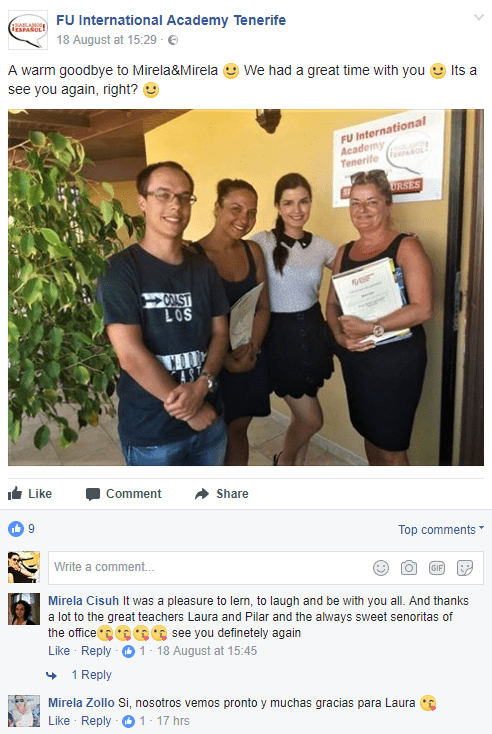 I attended the Business Spanish Course for one week and I am of the opinion that this course improved my language skills. My teacher did a lot of different exercises and thus, it never got boring. Thanks to the course I became more confident concerning using Spanish in daily life. I have been to several different schools in Spain and I wasn’t happy with them but I like this school a lot. I didn’t have any problems, everything was well organised: the accommodation, the leisure activities and of course the classes. Our teacher was very nice and kind; she explained everything very clearly and patiently, and I have learnt a lot. I would recommend FU International Academy to my friends! We liked the course very much. Lessons were very good because the teacher spoke in Spanish all the time and we were forced to understand her. Unfortunately, there was too little time, but enough to see that you are all very kind, open and ready to help. We enjoyed our time here. I came to study in this language school because a friend of my parents knew about it. I think the school is very good and I have learnt a lot. I studied in a small group and the teachers were very good. The classroom was large and bright and the chosen books suited my needs and helped me a lot. Altogether I spent six weeks at the FU learning Spanish and I would have loved to stay much longer, because I had a great time there. My teacher was really nice and caring. She always fulfilled our needs and the lessons were very interesting, so I could really improve my Spanish. The time here went by very fast because I met lots of very nice people and we had so much fun. I will especially remember our “Fiestas” in “El Cubano” for a very long time. I really enjoyed my time at the FU Academy. The shared apartment I lived in was large, bright and well furnished. The lessons were always great because all the teachers are friendly and highly motivated, and the groups are quite small. Apart from that, FU organises a wide range of leisure activities that are fun and varied. Puerto de la Cruz also offers a lot of opportunities to go out in the evenings so that you can practise what you learnt in school that day. All in all I spend an awesome time with great people! I am 75 years young! From time to time I come to live in Tenerife. I wanted to learn the basics in Spanish. Then, I would be able to communicate outside the tourist areas as well as in market place.In the 2 weeks I have been at the language Academy (30 hours, individual lesson) I improved my Spanish skills a lot.It was a lot of fun to work with my teacher, Daphne. My experience during these four weeks at the school were unforgettable. The accommodation is very nice, it is a good idea to put together students from different countries. The school is very well organised, and the teachers are very friendly, they are great fun and I have learned a lot in our class. The atmosphere is a very pleasant one for learning. Overall, the experience has been wonderful because I have met new people and got to know other cultures. We like the hospitality and kindness of the team. Learning the language in such a beautiful place is a pleasure. Also learning a new language in a country, where everybody speaks that language, is easier than at home. The classes were good, as was the method of teaching Spanish. The teacher was friendly and professional. The course of 60 hours, which I attended at FU International Academy has helped me to correct some errors which Italian students commonly make in the Spanish language. The lessons have been developed with 2 aims; in the first 2 weeks the focus was mainly on the grammar, in the last week, mostly verb forms and everyday conversation was addressed. I learned so much during my stay in the school. I needed to improve my Spanish for my Internship on Tenerife and the course helped me so much. There weren’t too many pupils in the class, the teacher was able to attend to our wishes and requirements. FU International Academy looked after me very well. We have been here in Puerto de la Cruz for 2 weeks and it has been so cool! We left the cold dark winter in Norway and found the sun, the warmth and a lot of nice people. We could practise paragliding, surfing, salsa dance and a lot of other activities. There is so much to do and it has been great fun, even the lesson time! Thank you for this great experience and see you soon! 351 queries in 4.109 seconds.